A pastor who allegedly murdered a prostitute after having carnal knowledge of her has confessed. 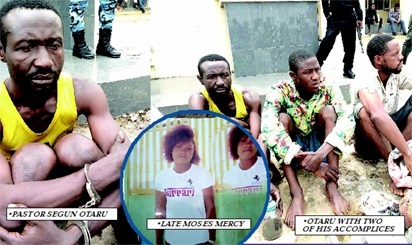 According to Vanguard, Moses Mercy, a suspected prostitute based in Ozuri, Kogi state, was said to have died at the hands of pastor Segun Otaru and three of his church members and it is suspected that his body parts were used for the ritual of the money. The main suspect, Pastor Segun Otaru, and three alleged accomplices, Abdulmumini Yakubu, Samuel Segun and Mike Stephen (in general) of the Voice of Canaan Church, C and S, Ozuri in the Adavi local government area of ​​Kogi state, They were among ten people accused of armed robbery, kidnapping and other vices in the state of Kogi. Public Affairs Officer of the Kogi State Police, ASP William Aya, confirmed the story and said that the pastor, through a hotel employee (hidden name) in Ozuri, had attracted the alleged sx workers, an indigenous State of Benue, from a hotel to your home. they carried out the act. Three days later, and Mercy had not yet returned to the hotel, the assistant became apprehensive and called them, only to be frustrated by his response. The assistant, apparently disturbed by the situation, informed the police in Adavi. Sensing that the Adavi police were dragging their feet, they took the matter to the police headquarters in Lokoja, who went into action and arrested the three suspects, and one of them was still a fugitive. Sunday Vanguard realized that the victim hardly participated in the "home service", but a decline in patronage for longer after the adverse economic situation in the country changed its position. She honored the invitation only to face her untimely death. The pastor and the alleged accomplices confessed the crime they blamed for poverty. Otaru told Sunday Vanguard that they got tired of their low life and decided to help themselves with the ritual suggestion presented by one of them that he said he had learned while he was staying in Abeokuta, Ogun State. On the idea of ​​having s-x with Mercy's body, Yakubu, who said he believed that sleeping with a dead lady would save them from a vehicular accident, said that the act of s-x was the same with a living woman. Police said they had launched a search for the fourth suspect, Mike Stephen. Otaru claimed that the Mercy case was the third time he would participate in a money ritual since the previous two attempts had failed. According to the 45-year-old man, he exhumed corpses from a cemetery in the two failed attempts and cut off the necessary parts for the ritual, but the money did not arrive. He said he expected to make at least N2.5 million from the last attempt that led to Mercy's murder. The main suspect explained that he had conspired with the three suspects, whom he described as members of his church, to commit the crime. Otaru said that the quest to get rich quickly led him to venture into the ritual of money since he could not wait for God to be rich. The pastor, however, said he knew that what he did was against preaching in Christianity and in the Word of God and that he would not enter the Kingdom of God. The disappearance of Mercy from the hotel where he used to practice his trade, for more than three days, had aroused the suspicion of a hotel employee. Two of the suspects, Oluwasegun Samuel and Abdulmumini Yakubu, had gone to the hotel in Adavi to pick up the deceased and took her away. Unfortunately for the suspects, they left their phone numbers with the hotel manager through whom they were contacted when the lady did not return. The PPRO said that the two suspects were arrested for the first time and, after being interrogated by the homicide detectives of the Criminal Investigation Department (CID), they confessed the bloody details of how they were allegedly hired by the main suspect (pastor) to get a lady for the money ritual with the promise of paying them N700,000. The arrested suspects took the police to Uhodo, also in the Adavi council area, where the remains of the Mercy were buried in a shallow grave and it was discovered that the vital organs and the head of the victim had been eliminated.